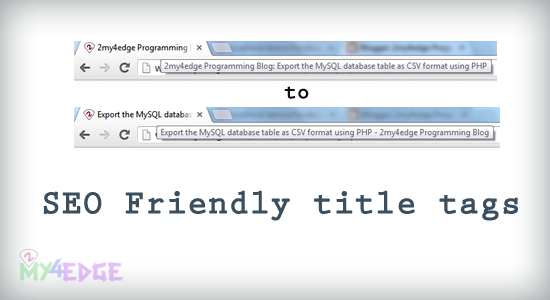 Most of the SEO experts are telling that, title tag is very important in SEO growth, so let we change our title tag for our convenient and also for grow the SEO, here i'm using blogger, so let see how to change the blogger title as SEO friendly title tag. for improve the SEO, each and every step of customizing blogger and web site is very important, let see here how show the SEO friendly title tag. see in the above image, and the image first is usually present in the blogger, and we have make it as the second one. let see how it is, and open the blogger. or make sure that in your web site make like this kind of title for grow your web site SEO. Choose TEMPLATE and Click on "EDIT HTML"
Save the template. and refresh the page. see the title on the browser.